February | 2006 | That Mall is sick and that Store is dead! 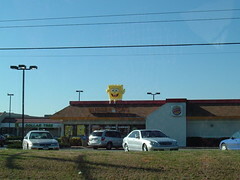 This picture is from Decmeber of 2004 when Spongebob Squarepants first graced the roofs of Burger Kings. This Burger King is in Smithfield, VA. I learned from Gary’s flickr album that he is back on the roofs of BK’s. That Dollar Tree in the background used to be an Eckerd until it moved to a free standing building next door to the shopping center. 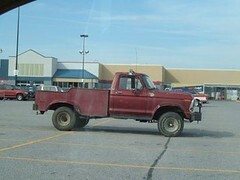 Wal Mart Buys The Paint On Clearance? The Wal Mart in my town is getting a remodel, and the outside of the building was painted with a fresh coat of something that looks like it came off of the “whoops! We made a mistake!” clearance shelf. I dunno what’s worse, the old grey, white and blue motif, or that new color. This past week they finished painting it, and its that “bleh” color on top and its still grey on the bottom. And the blue parts are still intact. Bill has been keeping a good eye on the now vacant Toys R Us in Hampton for me. GEX went out of business sometime, I believe, in the early 70s. The membership concept was totally abandoned during its last years of business.Someone tried, and failed miserably, to reopen GEX under the same name a few years later. When the concept didn’t appear to be working, the store was remodeled and given a new name–GEX General Store. That went over poorly as well, and the entire complex folded except for GEX Automotive. It remained open, selling tires at heavily discounted prices. Toy’s ‘r Us was definitely open by 1980 or so. I used to go in there and browse their selection of Atari 8 bit computers and software, which were in many department stores at that time. Bill says that there are ” have been workmen inside of that Toys ‘r Us every day that I’ve been by since the store closing–even Sunday!” I wonder if the store is being reformatted into a Babies R Us. Or simply, the Toys R Us corporation has to gut out everything after a store closing. 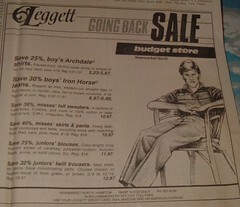 This is an ad for the Leggett at the old Newmarket North/Newmarket Fair Mall. It closed in 1994. I love the prep illustration ad. He just looks so stuck up! I believe this is as from around 1985. He’s like an arch nemisis in a Revenge Of The Nerds movie or something. So yesterday, I drove out to Newport News to do research on my speech I’m doing about Newmarket North Mall/Newmarket Fair Mall. I went to the big main library, and they have this big room just full of old phonebooks, microfilms, files of old newspaper clippings, it was my dream come true. I told the woman there what I was looking for, she turned away from me, walked a few feet, opened up a file cabinet, and she gave me a folder with a few clippings on the mall from The Daily Press (photocopies of the mall on opening day on March 26, 1975, newspaper clippings about the mall’s disastrous remodel in 1990, a 1994 article on “How’s Newmarket Fairing?” — get it? Newmarket Fair = Newmarket Fairing, hehe lame deadmall geek joke). 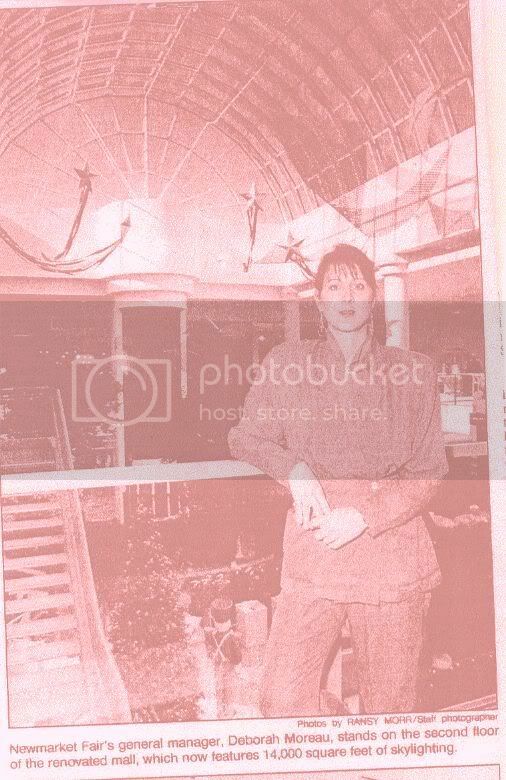 So since we found the date the mall opened while looking through the clippings, she showed me how to use the microfilm (Yeah, I’m 22 and I’m just learning how to use Microfilm) and I could’ve been in there for hours and hours looking at old microfilms. 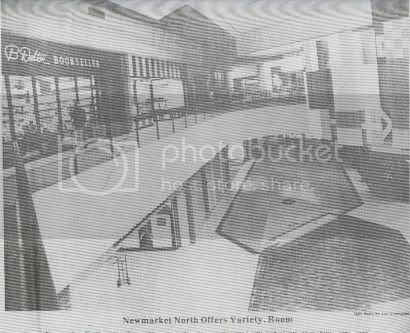 I did find a microfilm of the day before the mall opened, and I can finally get a clear image in my head of what the mall looked like when it opened. I have no memories of the mall before its disastrous remodel. I call it disastrous because the mall really took a nose dive after the remodel, and the color scheme of the mall — gray, fushica, turquoise, yellow, light blue was outdated 3 years later. 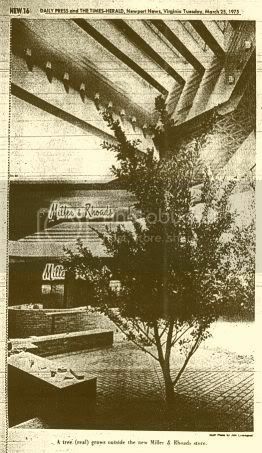 Picture #1 is from 1990 when the mall got a remodel that Debbie Gibson would’ve loved, picture #2 is right before the mall opened, and picture #3 is a picture of the old Miller & Rhoads store that I never got to see growing up (it closed in 1990). I “dyed” the scans colors because I’m putting them in a power point slideshow, and it looks better than just b&w scans. I also went to the ex-Howard Johnsons that is now a Chinese restaurant in Newport News as well yesterday. It looks really nasty on the outside, but its beautiful in the inside. It’s this huge buffet place, and almost everything in the place is brand new, and they had some unique stuff that I have not seen at a Chinese buffet (at least not out here) like oysters, and stuffed mushrooms, and scoopable ice cream (not soft serve [although I do love soft serve] like at Ryan’s — is that place defunct? The Ryan’s in Newport News and Suffolk closed a couple of years ago) If only they’d do something about the outside of the place. It’s not in a great part of town either, I came in at the tail end of lunch time, and the Rouse Tower workers were getting ready to leave and the crazies were getting ready to come in. This old man who had ordered take out was saying that he was buying Chinatown out or some crazy stuff. Worlds Largest Fireplace …. and Candlesticks? 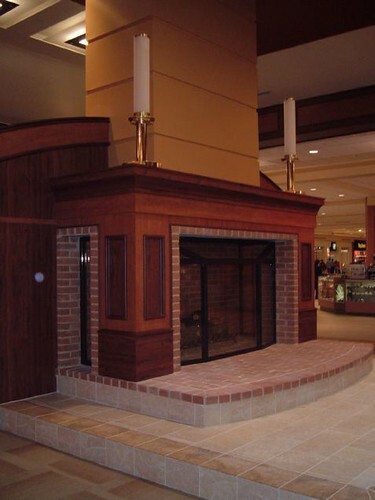 I understand the new fireplace in the Patrick Henry Mall’s new foodcourt (“You understand the fireplace? koo-koo!” [/Franklin Sherman]). That’s great. What I don’t understand is the HUGE candlesticks! Why?!? 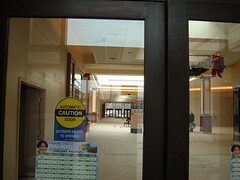 I was too scared to take a pic in the new mall wing (that’s not finished yet), so I took them through the doors. 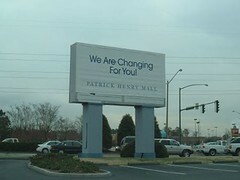 They finally covered up the old movie theater marquee at Patrick Henry Mall. The movie theater probably closed in the mall in the late 1990’s. I think an old Navy is there now? I think the movie marquee was also the Mall’s entrance sign. This is the new Borders. I wasn’t too impressed with it. Here is a picture of the store while it was being built. Here’s a pic when it was just a skelton of the former Dillard’s mens and children’s department. Hampton officials and the owners of the Coliseum Mall are planning its transformation. HAMPTON — Hampton officials and the owners of Coliseum Mall are nearing a deal that would transform the 33-year-old indoor mall into a “town center” with city blocks, park space and multistory buildings with offices, apartments and retailers. 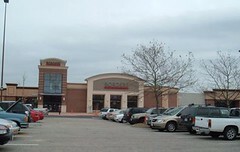 Facing years of sharply declining sales, a bleak future for traditional enclosed malls and stiff competition from newer retail centers, New York-based Mall Properties wants to pursue the town-center concept first laid out in a 2004 master plan commissioned by the city, said Howard S. Struletz, the company’s vice president. Plans for potentially more than $200 million in changes – with $65.5 million generated through special taxes on the new center – would build an outdoor shopping district similar to those that have emerged across the country to compete with indoor malls. Public squares and street-level parking combined with restaurants, stores and apartments would convert the boxy mall and sea of asphalt into several city blocks that the developers are calling the Peninsula Town Center. Mall Properties and Hampton officials have not reached an agreement on how the development would take place and how it would be paid for. But getting to that point hinges on a City Council vote scheduled for tonight. Council members will vote on whether to create a Community Development Authority that could sell bonds and set special taxes in the mall area to help pay for an expected $65 million in costs for land, public spaces, parking garages and roads. Early in 2005, mall officials said the redevelopment would cost about $200 million, but with the final details still in the works, Mall Properties would not confirm if that number still stands. The Community Development Authority would be a City Council-created entity, but the city would not be responsible for the debt created by the bond sale. The authority would pay off the debt by setting special real estate and property taxes on tenants within the redevelopment district – essentially, the current 76-acre mall property. City officials could also agree to dedicate a percentage of sales, meals and amusement taxes generated in the mall district toward the debt. But the details of that proposed tax structure have not been made public. The mall’s sales and vacancy numbers in recent years pointed toward the need for changes. More than 40 percent of the mall’s retail space stands vacant today. Attempts to lure stores such as Kohl’s, Best Buy and Stein Mart to the vacancy left by Dillard’s closing all failed. More than 100 tenants have left over the past five or six years, and only half have been replaced. As for overall sales, they’ve dropped from just under $140 million in 1999 to about $112 million in 2004, according to data from Mall Properties and the city’s Commissioner of the Revenue office. Struletz said Mall Properties wants to begin construction work this summer and open the new center for business by the fall of 2008. The construction plan also remains up in the air, but will require shutting down large sections of the mall at a time. Based on current plans, the only buildings that will be part of the new development would be the Hecht’s, soon to become a Macy’s, and three restaurants along Coliseum Drive – Outback Steakhouse, Bennigan’s and Steak and Ale. Store owners and tenants at Coliseum Mall are aware of the pending changes, but few know any details. Struletz said he has spoken to tenants, but only in general terms. Dan Kelleher, executive director of the Coliseum Central Business Improvement District, said retail owners in the district “resoundingly support” the concept of redeveloping the mall. "Buying a camera required getting film."